You are a Gemini if you were born between May 22nd through June 21st. The zodiac sign for Gemini is regularly symbolized as the twins, and sometimes the Gemini woman might seem to be two different people as well. The Gemini female personality is more prone to emotional changes than any other woman in any other zodiac sign. This emotional unbalance can make a Gemini woman’s life much more complicated. Being a Gemini woman is not all that bad. 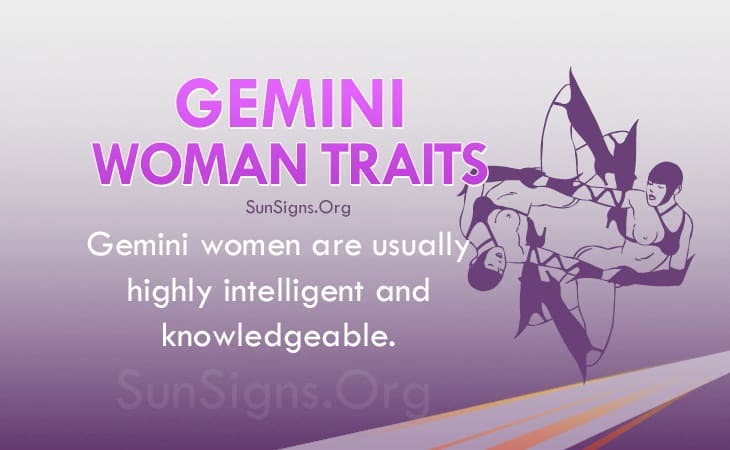 After all, Gemini women are usually highly intelligent. Gemini women crave knowledge. The Gemini woman traits show they are constantly wanting to learn more and to be able to understand things better. Whether it’s sitting down and reading a book, or making something with her hands, the Gemini woman loves to learn. She is likely to travel so that she can learn about other cultures and environments firsthand, learn to play a musical instrument, or learn a new language. Learning and accumulating knowledge is an exciting Gemini woman personality trait. She will likely be in a better mood once she learns something interesting, and she is likely to share her findings with her friends. The Gemini women’s life is all over the place emotionally. Her emotions will become confusing about the time that she becomes a teenager, as this is usually when the most social pressure is applied for the first time. The Gemini woman characteristics show she will want to be able to fit in, but she will not be sure how she is supposed to. This will cause her to become confused. She may either make some friends with people who seem to have themselves put together so that she can learn something from them. Or she will spend her time alone, as to not bother others with her uncontrollable emotions. While the Gemini woman has some trouble controlling her emotions she is not one tolash out. It is more common for a Gemini woman to fall into a depression or to become overwhelmed with anxiety than it is for her to scream and hit someone. The Gemini woman traits show she will want to try to keep her emotions to herself, but it is often easy to tell when she is not feeling well. It is not very hard to pick a Gemini woman out of the crowd. She needs help from friends and family to improve her mood, but she is not likely to ask for help. The Gemini woman personality traits show she has a hard time making commitments to anything, jobs and romantic partners. She is worried that her emotions will get in the way, or that she is not able to complete the task at hand. It is not likely that a Gemini woman will want to be in charge of a large project. She would rather do simple tasks given to her by her superiors. If she cannot do what is asked of her then it is more likely that she will be more upset with herself than he superior would be. It is likely that the Gemini woman personality will enter a group intending to only be in it for a short while, so that she will not be committed. But if she especially likes the activity or group then she will likely stay in it for years to come. So much of the Gemini woman’s life depends on how her emotions were while she was doing something. If she was feeling bad then it is likely that she will not like the activity regardless of if the activity caused the feeling or not. The Gemini woman characteristics show she will be nervous about entering a romantic relationship. She will not want to commit, but at the same time she will want to fall in love. Love can be complicated for the Gemini woman. A Gemini woman needs a partner who can help them emotionally. She needs a partner who can understand her and who is kind. If her partner can help her, then she will in turn be a loving partner for a long time to come.